UPDATE:- Greybaby had a successful surgery to remove his eye and is back home recuperating. 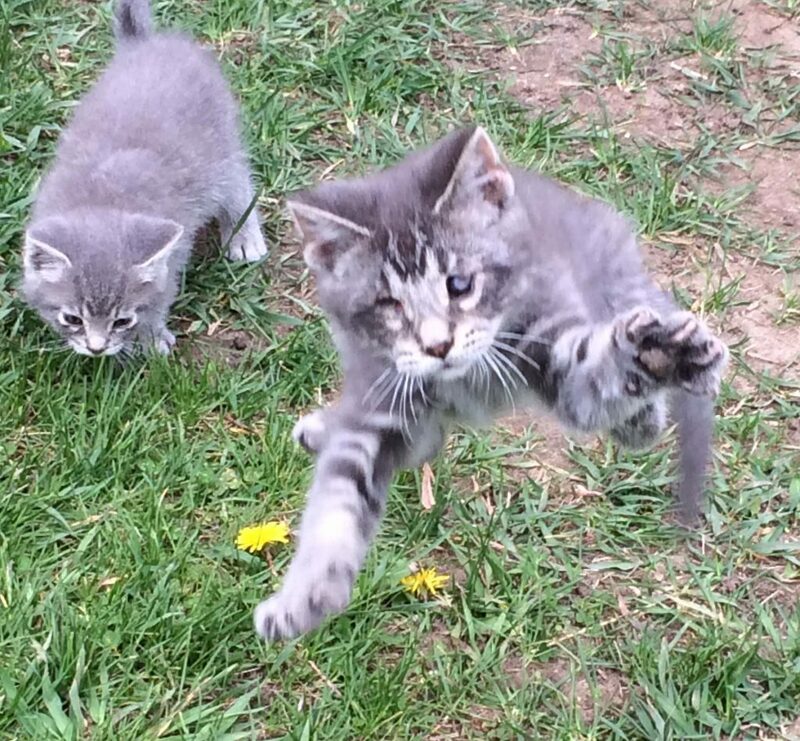 When Greybaby’s eyes opened, they seemed to be a little “off”, like he wasn’t able to see that well. One eye seemed to have a film over it, and both had discharge. I started washing the eyes out several times a day. It didn’t get any better, but didn’t seem to get any worse. Then one eye started to swell, the other seemed to do the opposite. I called and made an appointment with the veterinarian. The vet said that the eye is infected, that there was nothing that could be done except to remove the one eye. Greybaby won’t survive unless the eye is removed. The other appeared to be gone, most likely ruptured, and it would also need to be explored when the other eye is removed. Either that, or euthanize him. That isn’t a choice for me. I will do what I have to do to save him. I have been trying to save money for his surgery. I have some, but not nearly enough. In the meantime, I asked to doctor to refill the amoxicillin to keep the infection under control, somewhat, until I can save the money. I explained to the receptionist that I only work part-time at the local newspaper, and, unfortunately, it will be months before I would be able to come close to enough for the surgery. I am afraid that the antibiotic will stop being effective and the infection will go to his brain and it will be too late before I can save up enough. He is a wonderful, sweet, lovey kitty. He loves to explore, climb up my leg, get belly-rubs and play with the other kitties. He amazes me every day. He doesn’t know that he is any different from any other kitty. Anyone watching him would not know that he is blind. Until you see his little face, his eyes, you don’t know. I love him so much. Greybaby and I would appreciate any help from anyone. He deserves a chance to have a life. He is so FULL of life. He can make anybody smile, just by being his goofy self!! Theme: Illdy. © Copyright 2016. Companion Bridge Inc. All Rights Reserved.